Hermetic Library fellow T Polyphilus reviews Spirit Vol. 1 by Darwyn Cooke and Jeph Loeb, art by Darwyn Cooke and J Bone. Will Eisner is a comic book artist’s artist, and I’m a mere comic book reader. So I haven’t much explored his oeuvre, though I did once read A Contract with God. I hadn’t read Eisner’s own Spirit comics (much-reprinted in the 1990s), but I was intrigued by the trailer for the recent film that Frank Miller based on them. I had also noticed that the 21st-century DC “reboot” of the character had received some critical praise. This reprint volume containing the first six issues of the latter I borrowed from the public library on a lark. So I don’t know how “faithful” it is to Eisner’s character, but it sure is fun. Darwyn Cooke’s art is vivid and accessible, and his stories are wide-ranging. 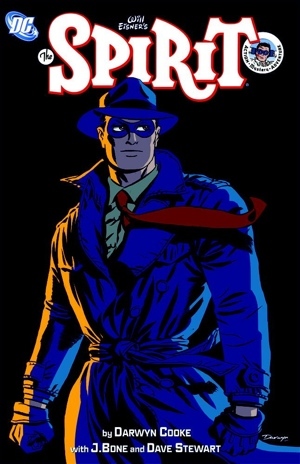 The Spirit is a vigilante of the amazing-but-not-quite-super hero type, like earlier pulp protagonists such as the Shadow and the Phantom Detective. He’s more fallible than his archetype, especially when it comes to women. Both Cooke and his Spirit have a sense of humor. Appended to the initial run of the DC series, this volume includes a reprint of the Batman/Spirit crossover story that served as a prequel to it. This piece, a collaboration by Cooke with writer Jeph Loeb, highlights the parallels between the two heroes to an almost painful degree. A telling exception is the omission of the Spirit’s counterpart to Robin the Boy Wonder. In the 1940s Spirit comics, a sidekick named Ebony White was largely a blackface stereotype that could only be read as racist if rendered that way today. Evidently, Cooke hadn’t yet come up with his solution to the Ebony dilemma, although the later Spirit issues introduce the character as an updated stereotype: a streetwise black kid with plenty of criminal experience but a good heart. This entry was posted in Hermetic Library Reading Room, T Polyphilus: Vigorous Food & Divine Madness and tagged books, Darwyn Cooke, Dave Stewart, J Bone, Jeff Loeb, Reading Room, reviews, T Polyphilus, The Spirit on June 28, 2014 by John Griogair Bell.